January 11, 2016 – In this episode, we’re going to Charleston our way back to the Manhattan of our theme song, New York Ain’t New York Anymore. Yes, it’s the Jazz Age of speakeasies and Prohibition — and our tour guide is none other than the Theater Districts most famous resident ghost, sighted from time to time in the New Amsterdam Theater. 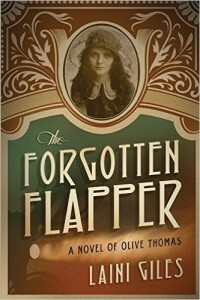 Our guest, author Laini Giles, has written our ticket to one of Hollywood Land’s very first scandal in The Forgotten Flapper: A Novel of Olive Thomas . You may not know Olive’s name today, but a hundred years ago she was one of the loveliest girls who ever lit up the Ziegfeld Follies or the silent screen. Laini Giles’ previous novel is Love Lies Bleeding . You can follow her on Twitter @4GottenFlapper and visit her online at LainiGiles.com. Laini is also happy to share some other Jazz Age books in this episode. They are Loving Frank , by Nancy Horan. Hollywood Babylon , by Kenneth Anger. Bobbed Hair and Bathtub Gin , by Marion Meade.